Keeping residents engaged is a constant challenge facing the field. With more than half of all assisted living and nursing home residents having some form of dementia, senior housing operators must work harder than ever to keep those residents engaged and acclimated to their surroundings and living in an environment that recognizes and appreciates residents’ unique needs, interests and abilities. Reaching that goal can be challenging, but those committed to the task agree their efforts deliver substantial rewards. Dementia affects not only memory, motor skills and sensory abilities, but also visual perception. As dementia progresses, language and overall communications skills also diminish. Such deficiencies may increase agitation and confusion and the need for psychotropic drugs. Additionally, they may up the risk for isolation, falls and elopement, and subsequent illness. Innovative practices and solutions geared toward residents of all levels of cognitive decline can help mitigate those risks, improve quality of life and allow residents to age in place longer. “Well-developed memory care programs are important to market because they offer a competitive advantage, but more importantly, they are tied to reduced hospitalization and other health and wellness benefits for the resident,” says Charles de Vilmorin, CEO of Linked Senior. New learning and delayed dementia progression can occur when those with mild cognitive impairment are supported through targeted programming; however, they aren’t the only ones to benefit. Even those with severe dementia can stay connected and positively engaged if there’s a facility-wide commitment to delivering person-centric programs and services. Today’s most enriching and successful resident engagement approaches combine hands-on, human interaction with innovative, intuitive and easy-to-use technologies that are scaled to each resident and facilitate positive exchanges between caregivers, loved ones and residents. “We believe that the most effective way to help caregivers better engage with dementia residents and acclimate them safely and effectively to their surroundings is to facilitate closer and more constant contact and communication,” says Neil Sullivan, chief operating officer at Connected Living. It’s also critical that the care team understand who each resident is now — every day and in that very moment, reminds Jenni Dill, life engagement director at Chelsea Place, an Anthem Memory Care community. Baseline and ongoing assessments are equally important to ensure residents are always met at their current levels of cognitive ability. Unfortunately, free and accessible tools, such as the Global Deteriorization Scale, which assesses primary degenerative dementia, aren’t always used to their fullest, de Vilmorin says. A wide range of technologies can help residents with dementia connect with caregivers, interact with family members and other residents, and safely adapt to their environment. Computer- and web-enabled solutions, in particular, are bringing useful applications to the masses, and many can be uniquely tailored to a community’s broader memory care and wellness programming. Brookdale Senior Living’s Clare Bridge Memory Care program relies on technology to assist with person-centered engagement content. The tool, named InTouch by Brookdale and created by It’s Never 2 Late, lets caregivers and residents pull customizable content at the touch of a fingertip that supports each domain of well-being. Juliet Holt Klinger, senior director of dementia care and programming for Brookdale, says she receives stories from communities almost daily on how the technology has improved resident lives. There are instances where the technology brought someone closer to a relative via video chat, for example, or brightened a resident’s day when he or she was able to read the home- town newspaper again after many years. One resident’s anxiety and behavioral expressions diminished by playing drums on the virtual drum kit, she says. One of Holt Klinger’s biggest surprises with the technology was how successfully it was adopted by residents with later stages of dementia. “In fact, our residents living with moderate to advanced dementia were the earliest adopters of resident-use technology at Brookdale,” she notes. When considering how technology will be incorporated into a community, she recommends selecting computer technology with a user-friendly interface, meaningful software applications and a touchscreen to help remove usage barriers. Also essential is a technology’s ability to provide exercises that precisely match a user’s ability at that moment in time. This allows individuals with dementia to receive cognitive stimulation without the fear or frustration of failure, explains Dan Michel, founder and Executive in Charge at Dakim Inc.
That’s certainly been the case for Prestige Care communities. The operator’s robust and activity-rich memory care programming program, named Expressions, received an Innovators Award in 2012 from the International Council on Active Aging. At its heart are innovative care techniques and treatment approaches that turn daily activities into memorable and meaningful events for residents with dementia. Programming focuses on learning, the arts, spirituality and the development of new skills. Technology plays an important role, explains Hollie Fowler, senior director of product and brand development at Prestige Care. The same is true of Prestige’s lifestyle program, Celebrations, which uses a wellness-based curriculum that emphasizes cognitive exercises to strengthen brain health and decrease the risk of degenerative brain diseases. “We chose a solution that could offer customizable programming and be tied to our programming,” she says of the Linked Senior platform, which allows the care team to align computer-based content to its wellness themes. For example, for Prestige’s heart healthy programming, Linked Senior content provided food demonstrations as well as music and trivia geared to the theme. The platform’s interactive touchscreen kiosks and tablets let Prestige custom-design interactive therapy for each individual. Fowler says they also use the dashboard to track and monitor progress, and see how communities are using the tools. Sometimes, technologies’ greatest benefits come in their more basic offerings. Computer-based technologies that give residents with dementia easy access to photos from their past or images of their various interests can provide comfort and help them relive happy moments in their lives. 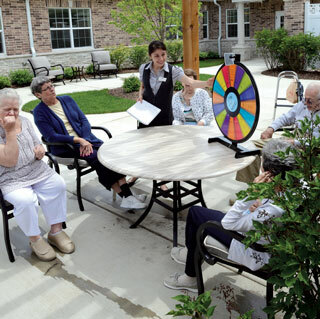 “A senior living community’s directory of residents and staff can also help seniors with dementia remember the names of caregivers, or make new friends,” says Ashlee Bartko, marketing manager for Touchtown Resident Engagement Solutions. Touchtown’s Community Apps also can help family members stay informed about the community and loved ones. Connected Living’s CL Mobile App allows for private family and friend networking and the sharing of social pictures that can be turned into a digital memory box in slideshow mode. The application also offers an activity tracker and has geolocation features that allow seniors, caregivers and family members to set a specific location and receive an alert when anyone comes or goes from that location. Whichever approaches a community takes to reach its residents with dementia, the community must stay committed to helping caregivers understand and respond to each resident’s wants and needs, and then use that understanding to engage meaningfully with residents. “Effective engagement doesn’t need to be a complicated process. If we know a certain resident takes coffee with two sugars and a creamer, for example, that can go a long way toward improving communication and building trust in the moment. The resident may not remember the caregiver from the day before but will know that the caregiver knows who they are,” Sullivan adds.